Maria Orazia Gentile first appears at Painesville, Lake County, Ohio, in 1906. When she immigrated to the United States Painesville, Ohio, was her destination. Maria Orazia Gentile immigrated with her children, Maria Cardegna, Felicantonio Cardegna, and Giovanni Cardegna. In America Maria Orazia Gentile was known by her married name Grace Cardina. Maria Orazia Gentile, daughter of Giovanni Gentile and Maria Carmina D’Orazio, was born on March 28, 1867, at Frosolone, Isernia Province, Molise, Italy. 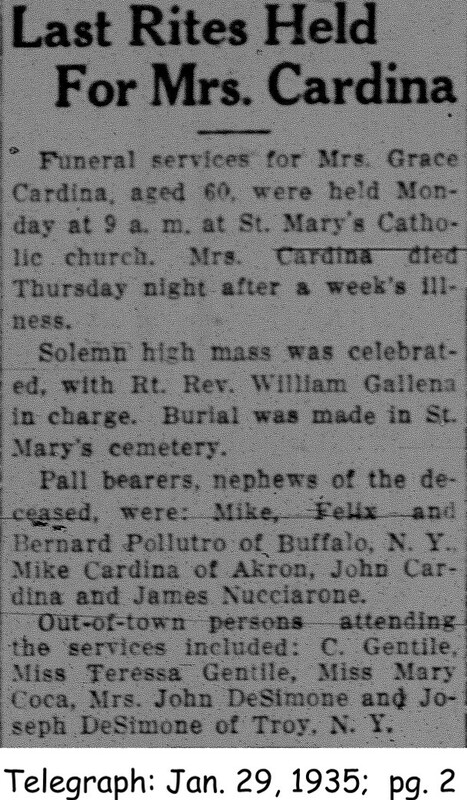 Maria married Michele Arcangelo Cardegna, son of Felice Cardegna and Maria Giovanna Fazioli, on July 20, 1893, at Frosolone, Italy. She died on January 24, 1935 at Lake County Memorial Hospital, Painesville, Lake County, Ohio, at age 67, of a uremic coma. Her body was interred at St. Mary Cemetery, Painesville Township, Lake County, Ohio. Maria Orazia Gentile immigrated to the United States on May 31, 1906, at age 39. She was travelling to Painesville, Lake County, Ohio. Maria Orazia Gentile immigrated with her three children. The family was joining the family’s father, Michele Arcangelo Cardegna, in Painesville. They arrived in the United States at the Port of New York City aboard the ship SS Gera. Maria Orazia Gentile was enumerated for the 1910 Census of the United States, on April 23, 1910, living at Henry Street, Painesville, Lake County, Ohio, as a wife of Michael Cardina. 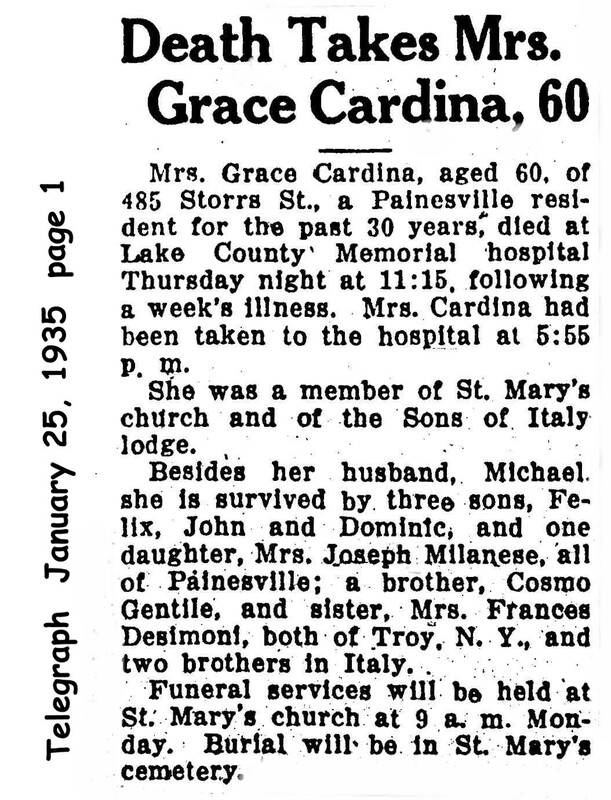 Maria Orazia Gentile was enumerated as Grace Cardina. Maria Orazia Gentile was cited on the World War One draft card of her son, Felicantonio Cardegna, when Felicantonio registered for the military draft on September 12, 1918. Maria was living at 131 Storrs Street, Painesville, Lake County, Ohio. Maria Orazia Gentile was enumerated for the 1920 Census of the United States, on January 13, 1920, living at 131 Storrs Street, Painesville, Lake County, Ohio, as a wife of Michael Cardina. Her name was recorded as Grace Cardina. 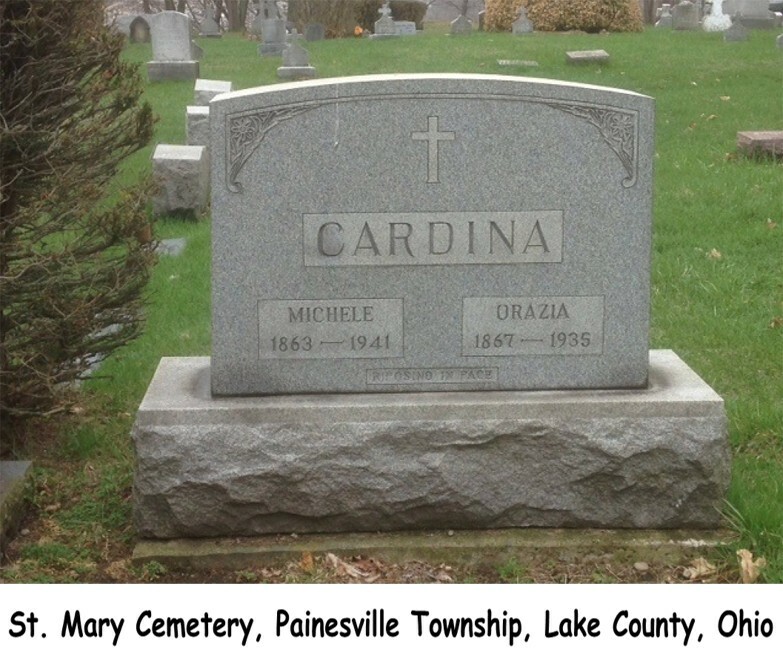 Maria Orazia Gentile was enumerated for the 1930 Census of the United States, on April 11, 1930, living at 485 Storrs Street, Painesville City, Lake County, Ohio, as a wife of Michael Cardina. Her name was recorded as Grace Cardina. At the time of death, Maria resided at 485 Storrs Street, Painesville, Lake County, Ohio. Maria Orazia Gentile had two brothers, Nicola Gentile and Berardino Gentile, who also lived in Painesville, Ohio.